my sweet old etcetera: Sleeping Beauty's got nothing on me. Last night I slept 12 hours. TWELVE HOURS! Normally, this would not be a big deal for me. In my teens, I could easily sleep 12-15 hours a night. And enjoy it. Boy, would I enjoy it. To this day, there are few things I like better than sleep (though chocolate is a close contender). But now that I am working woman with a career and bills to pay, sleep has become a luxury. Something to enjoy only on the weekends, if at all. Let me give you my typical workday: My alarm rings every weekday at 5:30 AM. My dad comes in and wakes me up around 6:00 AM (nope, don't hear the alarm). I'm at work around 7:15 AM, 15 minutes before my students all traipse into my classroom. My last class finishes at 2:30 PM. I go home and waste time on the interwebs and hang out with the boyf. So what's my bedtime? 12:00 - 1:00 AM. The alarm rings again a scant 5-4 hours later and the vicious cycle begins anew. I guess saying I'm sleep-deprived is a bit of an understatement. You know how I know "Sleeping Beauty" is a fairy tale, at least in my world? Well, let me tell you. 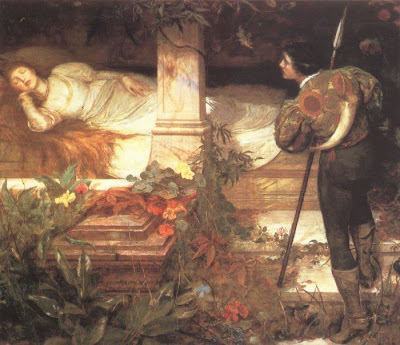 In the story, the only thing that can wake up our slumbering girl is a kiss from the prince. Well, here's the problem. Say I've been sleeping for a long time. How long? Oh, I don't know, how about 12 hours. That's a long amount of time. Say my "prince" (AKA, the "boyf") shows up after 12 hours has passed and attempts to wake me up via a kiss. Now, that's a very sweet gesture. It is. But it won't do a thing. I promise you. You can even ask the boyf. Nothing short of firmly shaking me by the shoulders will ever wake me. Not even my alarm wakes me -- my dad is my alarm clock every morning when he hears my alarm clock ringing from his room and has to come wake me up. I'm a super deep sleeper. I can sleep through hurricanes. Possibly even atom bombs. Sorry, Charlie, but this girl's out for the count. At least now that Spring Break has begun (YAY!!!!!!! ), the alarm clock can remain off for a whole blessed week and I can revel in my night-owl-ness. I can sleep to my heart's content. The boyf and I still don't know where we're going. Normally we plan a little get-away for this time of year. Last year we went to Tokyo, Japan. Trip of a lifetime! This year, we've got a few possibilities: London, England; Disney World; Mexico. We won't know until the last minute, as usual. And that's fine with me. I used to be the kind of person who liked to plan everything out and hated leaving things till the last minute. But the boyf has taught me to loosen up. Have a great weekend everyone! If I don't blog again for another week, don't worry. I'm probably just sleeping. ETA 2: I got a job as an "Examiner" for Examiner.com. I am their new Book Reviewer and will be posting literary-related articles once a week. I'll let you know when I post my first article. I'm excited because I will have my own byline and even a picture. It pays peanuts (roughly $10.00 for every 10,000 hits), but whatev. It's experience. sleep is heavenly. we went through "Death Be Not Proud" in English the other day, and it made me smile. "From rest and sleepe, which but thy pictures bee, much pleasure, then from thee, much more must flow.." true that, Mr Donne, true that! we've had a marathon LOTR movie day today, and i slept through one hour of the first movie. Hey! Yeh, I love sleeping too!! I'm exactly like you...I'm a night owl and spend ages on the internet just doing random stuff...I keep meeeaning to have early nights but they never happen, typically! And nothing can wake me in the mornings - total log! I'm actually off from uni at the moment - still got assignments to tackle though :S Gotta go in to London tomorrow to meet up with some uni friends for our a group project. Speaking of London!!! You should so come here for your spring break! Have you been to England before? Well, anyway, I know you'd love it!